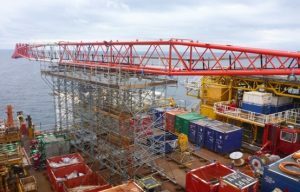 The Crane Boom on the Total Dunbar offshore platform had deteriorated due to harsh conditions and required changing with minimal disruption. The weather meant that the safety boat could only operate in certain conditions, so the amount of time spent erecting & dismantling the sections of the scaffolds classed as over board was a critical factor. The project required an access platform 21m long x 7m wide x 8.5m high with a platform loading of 2KN/m2, but with supports for the crane boom to carry a skate loading of 65KN. A second platform with the same loadings but 14m long x 5.5m wide & 8.5m high was also needed. At Total’s request, the design was changed from the original tube & fitting design to HAKI Universal. To cater for the huge loads required, the HAKI tripod system was also used as the vertical standards (each leg capable of taking a maximum of 200KN).